SolarLEAP is a non-profit organization based in Hong Kong committed to bringing information technology to students and individuals around the world. Whether off-grid or in the heart of a city, SolarLEAP's desktop computers provide a modern, standardized computing experience. Each computer is preloaded with a digital library of educational content, so that schools can make the most out of the technology even in areas without internet access. To see how you can help, visit our Get Involved page. SolarLEAP 2020 – the sky (or at least the sun) is the limit! Following a recent trip to Myanmar to meet with local partners and to visit SolarLEAP labs, the board of directors set about creating our near-term plan for growth in Myanmar: SolarLEAP 2020. Right now SolarLEAP has three up-and-running labs in the country, with one more close to the implementation phase (work on that starts in January in Shan state). Our goal is to have six working labs by the end of 2019, with a further two in 2020. It is our belief that eight labs throughout Myanmar will give us the critical mass necessary to create an effective country-wide network, enabling us to broaden our reach, partner with more local institutions, and bring SolarLEAP’s IT-driven educational solutions to many more rural locations in Myanmar. SolarLEAP is going to Shan State! Ann, our new Country Program Manager, has hit the ground running! Following a recent two week due diligence trip across central and north Myanmar, we have identified a monastery school in Shan state as the site of our next installation. We're currently working with solar panel and battery suppliers in HK to ship the equipment to start the installation, commencing work in January 2019. More on this to follow in the new year. To see Ann's work in Myanmar, take a look at her video detailing SolarLEAP's work in Mawgyun, and a video of Greg explaining SolarLEAP's philosophy on technology and local technical support. Following pilot installations in 2015 in the Myeik area — in the Mergui archipelago – and in a monastery school upriver from there, in 2016 we installed our third lab in Myanmar with over 30 computers in a monastery school in Mawgyun. In April this year we completed a site visit to the monastery and reinstalled the operating system so that it is now running at full speed. The lab has proven very popular with the local school children, with one teacher commenting: “when we arrive in the morning the children are lining up to get into the classroom and use the computers, and when it’s time to end for the day we have to pull them away from the computers!”. It’s exciting to hear how eager the children are to use SolarLEAP computers and their thirst for knowledge! Word of SolarLEAP’s technology and our educational content continues to spread in Asia. In early 2014, we were contacted by a school located on a small island in the Mergui archipelago, in southern Myanmar. With no access to a regular supply of electricity, and being about as remote as you can get, we knew that we could help. After a site visit in late 2014, we installed our first lab in Myanmar in February 2015. Following the success of the pilot project, we were contacted by a school on the mainland in Myeik who asked for our help. A week later SolarLEAP installed it’s second lab in the country! Over the past month, organizations in two countries have reached out to SolarLEAP requesting computer hardware to realize their ambitions. Solar powered computers should soon find their way into schools in rural India. Additionally, for the first time SolarLEAP has an opportunity to work in China! These projects will coincide with the new hardware design that should be finalized by year end. With funds raised for over 700 units, the next batch of installations will expand SolarLEAP’s reach tenfold. Thanks for being a part of organization through this amazing period of growth! Three years ago today, I arrived in Ghana with a bag full of hacked together solar powered computers, and a goal to provide computer access to as many students as possible. Perhaps it’s fitting that today was the day the final hardware revision arrived at SolarLEAP’s offices. Roughly three times faster than the computers distributed in Ghana, with just under 30% less power consumption, at the same cost. With this finalized design, SolarLEAP is equipped to scale to meet the global need of our computer technology. Over the next year, this design will be tested to its fullest before we embark on large-scale installation effort spanning four target countries. Just a quick update to drop a link to a recent video posted by A-CET, unveiling their new school opening, as well as SolarLEAP's most recent installation. Serving hundreds of students in rural Ethiopia, the school features a solar-powered computer lab with technology provided by SolarLEAP and installed through Stiftung Solarenergie, a social enterprise working in the area. Check out the video here! The start of two new years! Happy new year -- Western as well as Chinese -- to all friends and supporters of SolarLEAP! The new year is shaping up to be an exciting year for SolarLEAP. As I write, our latest shipment of computers is clearing customs in Ethiopia and soon will be installed in a newly built school by our friends at the African Children's Educational Trust and the Solar Energy Foundation. Closer to home, we are working to finalize manufacturing arrangements with our China-based technology supplier: SolarLEAP is on the verge of a very significant expansion as the first distributor of purpose-built solar powered computers in the world! Many thanks to all our past, present and future supporters for all the work to get us to this exciting point! After hundreds of hours with our manufacturing partner, SolarLEAP is set to produce 1,000 solar-powered computers by early 2012. 2011 was a productive year of fundraising, designing and meeting potential manufacturers, and after a long search and an exhaustive fundraising effort, weÃ¢â‚¬â„¢re ready to move ahead with our manufacturing run. With 1,000 computers ready to ship out, SolarLEAP has the potential to improve education for tens of thousands of students around the world, and we need your help. By sponsoring a computer Ã¢â‚¬â€œ or a computer lab Ã¢â‚¬â€œ you can help us reach at-need areas with this new and exciting technology. To make a tax-deductible contribution to SolarLEAP, please head to our donate page today! Funding for a manufacturing run of our solar-powered computer design has been reached! Thanks, everybody! This means we can now mass produce our own unique solar-powered all-in-one desktop computers, which are a massive improvement over current solar-powered computer technology. We still need sponsors for distributing these 1,000 computers. We can get our unique design of solar powered computer to Hong Kong; we need your help getting them out to the world. SolarLEAP has received a new prototype from our manufacturer after a close design relationship over the past two months. This design takes feedback from previous installation partners, and experiences IÃ¢â‚¬â„¢ve had working on two dozen installations around the world. This design improves on our old design in every imaginable aspect; from power consumption to performance to ease of installation and durability. Plus, it looks absolutely fantastic! With your help, we can turn this design concept into a full-scale manufacturing run to get this technology out to hundreds of thousands of students around the globe. If you would like to contribute to SolarLEAP, please head over to our donate page! Three installations in Ethiopia -- including a huge 15-computer lab! I've just returned to Hong Kong after a great three weeks in Ethiopia. This past month has been an incredibly busy time for SolarLEAP, with forty computers being installed in the field in four different locations. In Ethiopia, installations were provided both through an on the ground installation partner, the Solar Energy Foundation, as well as two educational services providers, A-CET and Oxfam Ethiopia. All installations went very smoothly, especially thanks to the worksmanship of the Solar Energy Foundation technicians, who drastically reduced installation time at these schools. Please check out the work of these stellar organizations, and take a look at the image gallery for more information on the work we did in Ethiopia -- one quote from a villager at the Gum Selasa school particularly sums the experience up: "with electricity and computers, We are no longer a rural community". Amazing!. Two successful installations in India! I am pleased to announce two successful installations in India! This marks the first time I have installed the SolarLEAP computers in the country, and it was great working with two excellent local project coordinators. The first school, located near Pune (outside of Mumbai), received five solar powered computers to help around 200 students practice both basic computer literacy as well as cross-curricular activites. The second installation was in a school located in Jaisalmer. This is a music-focused school for Merasi musicians. The three-computer installation provided them with basic computer literacy tools as well as a high-quality desktop microphone and free, open-source recording tools such as Audacity so that the students and teachers can record their music within their own facilities, for the first time. For more information, and photographs, check out the image gallery! It has been three months since the solar-powered computer installation at Canumay Extension National High School, and the impact the computers have had in that short amount of time is spectacular. I returned to the school last week to check in on the students and teachers and make sure the lab was working well. In just three months, students have been able to drastically improve their touch-typing skills and basic computer literacy, and also get a chance to use both the offline digital library and the internet to do work related to other classes in the curriculumn, both in English and Tagalog. It was a great experience to live in the school for a week, to stay late into the night and see the students stay behind after class to get extra time on the computers. Another interesting part of the installation three months ago is the effect it had on the community and the effect it had on the school: for instance, parents and other people from the village will stop by the computer lab later in the evening if students have gone home. The demand for these computers was so high that the solar panel (which can provide around eight hours of lab usage per day) was struggling to keep up with the user's schedule! Teachers also report that the enrollment of the school is higher than it was three months ago, as many students from the area who had previously dropped out of classes decided to re-enroll to experience a computer-based education. This is truly phenomenal social change, and I would like to thank everyone who donated to help make this happen. This computer lab could not have happened without your help, and it means a lot to the students and a lot to me personally that we could make this happen. If you have not yet donated, please head over to the Get Involved page to see how you can help! On the 27th of August, SolarLEAP set up a ten-computer lab in Canumay Extension National High School, near Antipolo city in the Philippines. The computer lab was equipped with ten SolarLEAP computers and ten SolarLEAP 17.3" widescreen LED-backlit monitors. The school received a 300-Watt roof-mounted solar panel array, charging three 100aH sealed lead-acid batteries. 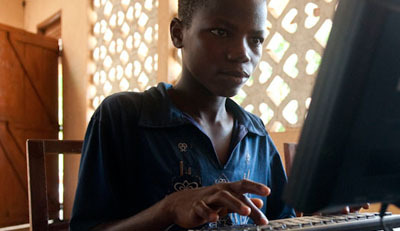 The school was fully networked with a local network connecting each computer to faciliate document and printer sharing, plus internet access providing via satellite. SolarLEAP partnered with GILAS, a local organization, to make this happen. To read more about SolarLEAP's unique computers, please visit our technology page. To see photographs from the Canumay High School installation, please visit our photo gallery.